Zinus Green Tea Mattress Review l Zinus Mattresses - Good Deal or Cheap? The best budget memory foam mattress? Following in the footsteps of a few other scented memory foam mattresses, the Zinus comes with a fresh new scent of its own. It comes in a variety of sizes (starting at twin) and thicknesses (from 6 inch to 12 inch) and has a brilliant price tag for the more basic model. 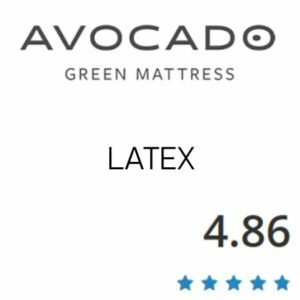 First impressions of this mattress are good. 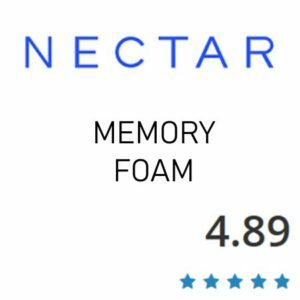 It offers an affordable alternative to memory foam beds that most simply could not afford – opening a luxury up to all and adding a strong dose of Certipur testing, pressure relief, support and airflow to even those of us who never thought they could afford a memory foam mattress. Zinus have a very well planned out website that accentuates all the features it needs to. It is easy to navigate, offers side by side comparisons with other mattresses (albeit of the Zinus brand). Further digging reveals that they have 9 different manufacturing plants in six different countries and were established in 2004. They have a solid reputation as mattress providers for the masses – while still retaining a touch of class. We wouldn’t go so far as to say we love this company, but throw in a good sustainability model and this is branding done right! • Want a touch of luxury for less of the price. • Are a back or side sleeper with aches in the hips or shoulders – this mattress is designed to give extra pressure relief where you need it most. • Sleep beside a partner who moves around a lot. This mattress scored highly in motion reduction. • Are worried about off-gassing and want a CertiPUR-US certified product. • Want to be able to choose from a variable thickness. • Don’t like to sink into your bed – try a sprung or hybrid mattress instead. • Tend to sleep very hot – try a mattress with a physically cooling layer built in instead. • Don’t want to increase your carbon footprint with all those air miles. The Green Tea mattress sports a very nice knitted Jacquard cover on top with a quilted feel. It is soft and luxurious and makes us wonder at the value you get for the reasonably low price of this mattress. The cover is highly breathable, promotes air flow under you while you sleep and also keeps you separated from the memory foam, so you don’t have that memory foam feel next to your skin. This is a full memory foam mattress with a refreshing Green Tea infused memory foam layer. This means that there is quite a lot of sinkage and not a lot of bounce. If you are looking for a bouncy bed this is not it. It does enveloped you when you lie in it and it sits in the middle of the firmness scale, with heavier reviewers noticing if felt more firm to them and lighter reviewers noting it felt very soft. That choice of fabric on top is also cooling and hypoallergenic, as well as Certi-Pur US certified even although most of the mattresses Zinus make are imported from China. We think this might be how they manage to offer such good quality for such a low price. We do note that the different thicknesses of mattress do have different comfort levels, and heavier users should not indulge in the 6 inch mattress just to be on the safe side. Additionally we note that the 6 inch mattress is thin enough to be used as a topper for another mattress, perhaps transforming a spring bed into a hybrid? The technology here is just so versatile. The Zinus Pressure Relief Green Tea mattress will take between 5 and 10 working days to deliver from the moment you order it. The mattresses may be manufactured in China but, forbidding supply issues, they are stored in the US until sold. When your mattress is delivered it will come vacuum sealed in wrapping and rolled up into a square box. This picking method saves on carbon emissions by reducing space occupied by each mattress. When your mattress arrives we recommend that you take it to the room you want to place it in as it can be harder to maneuver into place once it has been opened. Next, take a sharp tool and cut open the box. The mattress will unroll itself so be careful! When the box is taken away cut through the plastic sealing being cautious not to pierce through the fabric of the bed. Once your mattress is free of the packaging you can watch it expand to full size. It shouldn’t take longer than 24 hours to do so but some mattresses take up to72 hours to be at full size. You are able to use your mattress as soon as it arrives but don’t expect the best sleep until it is fully expanded. Traditionally speaking, memory foam beds offer fantastic motion reduction and the Zinus Green Tea mattress is no exception. 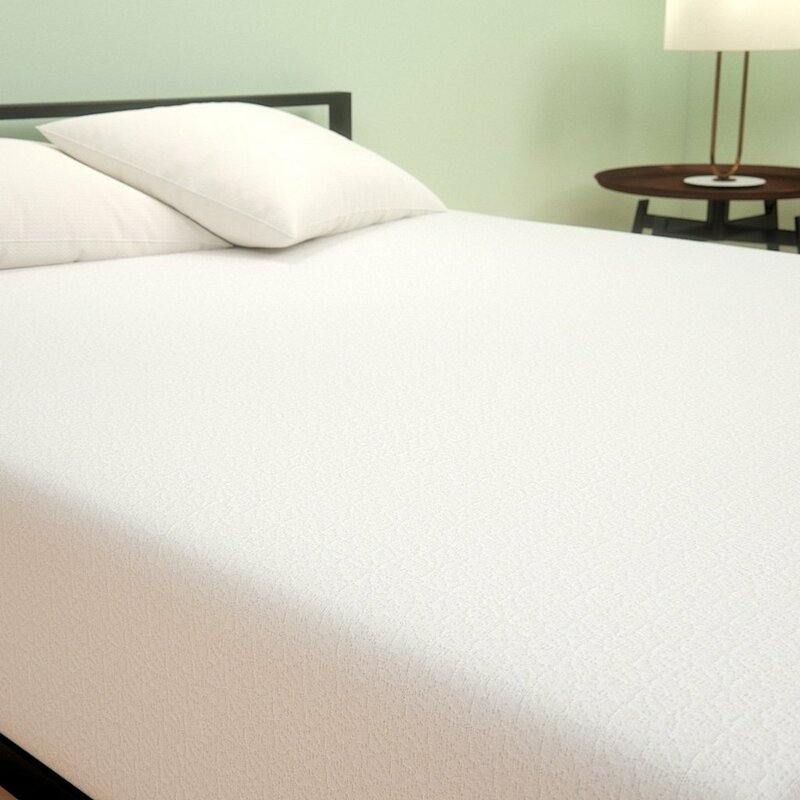 The nature of the memory foam material allows it to soak up and disperse the weight and movement of a sleeper, meaning that if you sleep beside a partner who tosses and turns, or who is up and down a lot throughout the night, you won’t be woken by it. The motion isolation of the Zinus Green Tea does not change with the thickness, rather it is the top layer that provides this stability and allows for optimum undisturbed sleeping. When coupled with that Green tea scent it offers a pretty unique sleep experience that promises sweet dreams all night through. To us, Off-gassing is a deceptive term. Any new product you bring home from the store is going to smell a little like the last place it was stored, or the facility in which it was packaged. This is no more dangerous than the smell of a new pair of shoes or a new car. However, if you are worried about off-gassing the Zinus Green Tea infused memory foam mattress is the perfect option. While natural or organic mattresses tend to smell the most; fumes are generally not toxic. If you are concerned about toxic fumes then the CertiPUR-US certification on this mattress coupled with the Green Tea scent makes a perfect combination of off-gassing pleasure. This mattress actually smells lovely when you unpack it and there is no need to be concerned about off-gassing whatsoever. If you do detect a ‘factory’ smell then you have a very keen nose. This scent will not linger and shouldn’t be noticeable at all once you add your mattress protector and sheets. Obviously the cover layer is the knitted Jacquard fabric that allows air to pass under you while you sleep while simultaneously wicking away sweat as you sleep. The thicknesses of the fabrics underneath then vary depending on which depth of mattress you ordered. All of the mattresses have the same core layers. 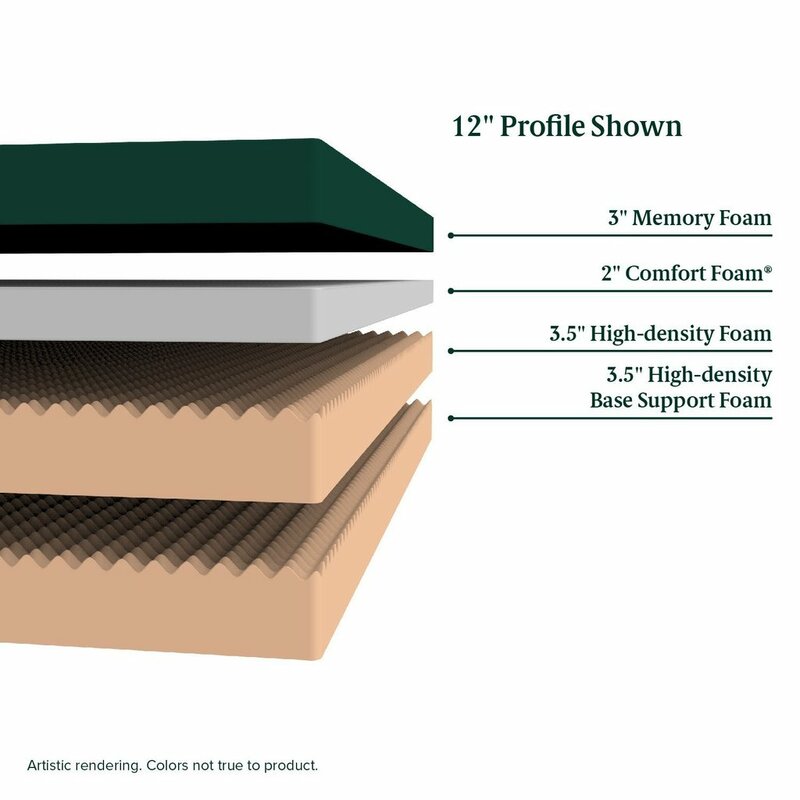 For example; the thickest mattress at 12 inches uses 3 inches of memory foam, a 2 inch layer of pressure relief high density foam of their own patent, a 3.5 inch layer of high density transitional foam that protects you from the base layer and a 3.5 inch base layer that provides the overall structural support. In the 6 inch model these dimensions are changed to a 1 inch memory foam top layer (this top layer is where the Green Tea gel infusion is placed) plus a high density base foam layer of 5 inches. This makes the thinner mattress of more firmness than the thickest mattress. The 8 inch model has two memory foam layers and the ten inch repeats this with greater thicknesses. It is only the 12 inch mattress that has all four layers. The Zinus Green Tea Mattress will work great on any solid surface. The floor, platform slats, boxspring/foundation and they now offer an adjustable base as well. 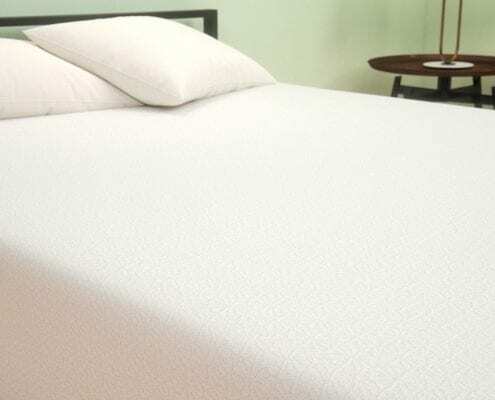 This is a temperature neutral mattress rather than a temperature regulated mattress. This means that there is no cooling memory foam infusion working to cool you down in the night. What they do have is that knitted top layer of highly breathable fabric that allows air to pass under you while you sleep. 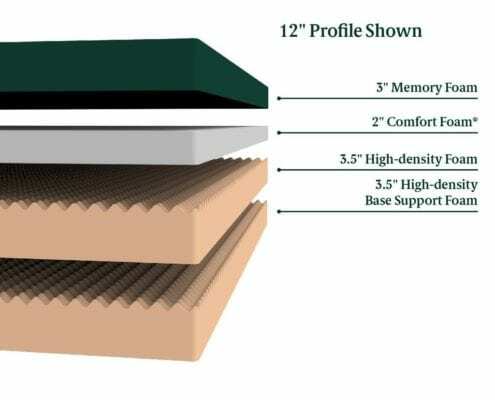 They also have three separate layers to allow for airflow and memory foam that has been specifically designed to help air move through the mattress even when it is condensed. 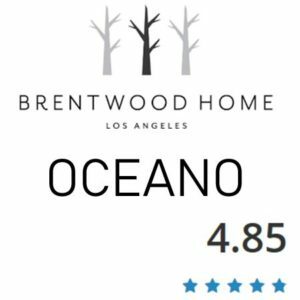 Once again this category is providing us with luxury quality at an affordable price. They are doing it by offering simple solutions to familiar problems that most big brand manufacturers spend thousands developing solutions for. We like their style. We gave the Zinus Pressure Relief Green Tea mattress a 10 out of 10 for temperature because it doesn’t promise to do anything it does not do. However, particularly hot sleepers should still opt for a cooling gel infused mattress or perhaps no memory foam at all. Although we didn’t film the Zinus Green Tea yet on a base you can be sure it will work fantastic on an adjustable base. The Zinus Green Tea Pressure Relief mattress comes with free shipping via FedEx – so you ought to be able to keep track of your delivery fairly easily. The mattress comes with a 100 night free sleep trial that includes no obligation to buy and is financially risk free. This is a decent deal and there is nothing wrong with it – it’s just that it’s industry standard in terms of length. If Zinus really want to go the extra mile here another ten nights would be perfect. The Zinus also comes with a ten year limited warranty – the limit being that it covers mattress defects such as sagging, puckering and indentations that won’t remove themselves. Again this is industry standard and it is a perfectly plausible amount of time – but we have seen other firms do better… still, we haven’t seen many other firms do better on such a good price, so we awarded them top marks anyway. Overall, we have fallen in love with the scent of Green Tea and the varying depths of availability to this mattress. The price actually astounds us for all of the features that you get. 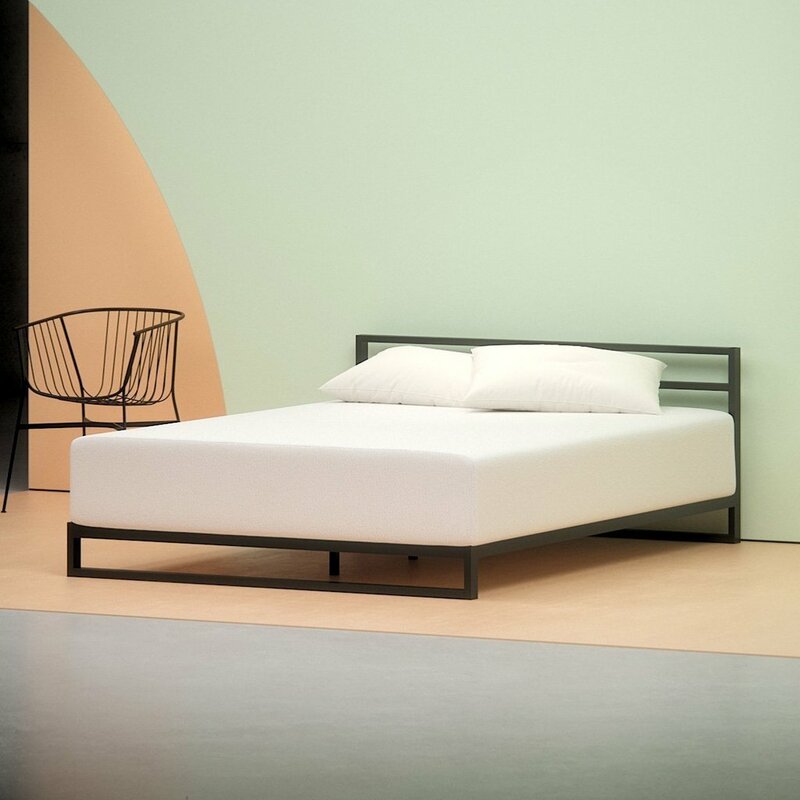 A true memory foam mattress is a little touch of luxury that usually comes with a high price tag; so the Zinus has turned out to be a breath of fresh air. The one area where this bed could do better is regarding edge support, but besides that do not be fooled into thinking the low price reflects a poor quality product because this simply isn’t true. Besides anything else that ten year warranty should be enough to assure you that all is well. We say well done Zinus: this is a mattress you can be proud of.